Laxius Force Game Review - Download and Play Free Version! Join a cast of 17 playable characters, including Random, the swordsman, and his elven girlfriend, Sarah, as they battle to stop the mysterious organization which plans to help the Demons ravage the land once again in Laxius Force. Download the free version, read user reviews, view screen shots, read about the game and more. Join in Another Epic Adventure! Get together with the young swordsman, Random Pendragon, and his elven girlfriend, Sarah Brandolino, as they come out of retirement. Having fought valiantly and defeating the terrible Demons, the couple secluded themselves and lived peacefully for seven months. Yet Sarah grew tired of living away from civilization and they decided to return to Tyrine. Much has changed in the world over their short respite and the adventuresome couple soon find themselves in another heroic quest. Help them and a whole cast of other characters as they travel across the land and try to stop the mysterious organization which plans to help the Demons ravage the land once again. Laxius Force adds on to the series with more classic RPG gameplay. Enjoy traditional turn-based battles as you choose between attacking, defending, using a special skill, or selecting an item. One way in which Laxius Force differs from some RPGs is that enemies can be seen on the field before engaging them.There are a few areas where encounters are random but most of the time you can pick and choose your battles. Another unique element to the gameplay is the fact that you can save at any time. This makes battles much easier given that you cannot flee from a fight. When you encounter an enemy, you have to fight until one side or the other is dead. Don't worry though since, even if you die, you are protected by the goddess Yveen who will resurrect your party at the nearest town or dungeon entrance for only 10% of your party's gold and you get to keep all the experience and items gained up to your death. Laxius Force presents gameplay which is heavily expository and character driven along with mature dialogue. Uncover all the twists and turns which somehow connect all the characters' tales together to form an intriguing and engrossing story. With its retro graphics. it fits in well with any of the 16-bit classic RPGs of yore like Final Fantasy or Dragon Warrior. With 17 playable characters and the fact that experience is only gained by members in your active party, get ready to learn about every single character as you swap between them for the best advantage in a given task. The sheer number of quests and side missions you have available means hours of gratifying gameplay as well. If you like RPGs and epic tales, then download Laxius Force today! 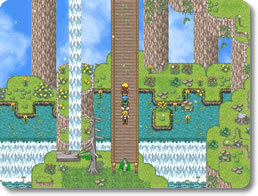 Laxius Force is a classic 2-D role-playing-game that runs along the same lines as the Aveyond and Final Fantasy series. All of the classic game elements are there, such as battling a wide variety of monsters, earning experience and learning new spells, and equipping your party with ever more powerful armor and weapons. 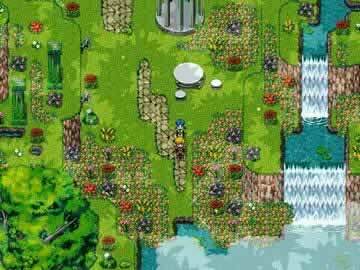 Fans of the RPG genre will certainly get a feeling of nostalgia with the 16-bit inspired graphics and turn-based battles found in Laxius Force as well. While the battle system is pretty much the same as other RPG's with a menu system to choose actions, the view is slightly different with just portraits of your party at the bottom of the screen and your enemies within the top window. Although this view may not agree with every player, it doesn't really affect the gameplay all that much and there are plenty of spell effects to liven up the view during combat. Additionally, combat in Laxius Force is slightly different than other RPG's in that you cannot flee from battle, although before facing very powerful opponents dialogue boxes allow you to runaway if your party is still on the weak side. This means that you pretty much have to resolve a battle no matter how many opponents you are facing. A nice feature though is that if all your party members fall in battle you are revived at the nearest town or dungeon entrance with only a loss of 10% of your gold, and you keep any experience and items gained prior to your party's death. Also, there is a “Rush” options in battle which sets all your party members to simply attack during that round which can speed up battles against weaker enemies. 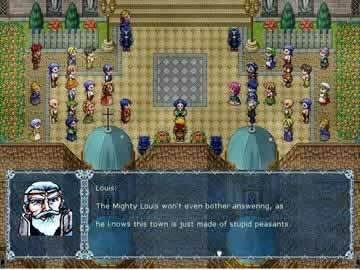 Overall Laxius Force provides a classic mid-90s RPG experience with an addicting storyline and loads of characters to interact with. The adult themes and humor might not be for all ages, but it is sure to please RPG buffs looking for some nostalgic gameplay. Also, the ability to choose a Normal or Easy difficulty makes it accessible to gamers new to the RPG genre. View clips from the game including travel and dungeon battles.